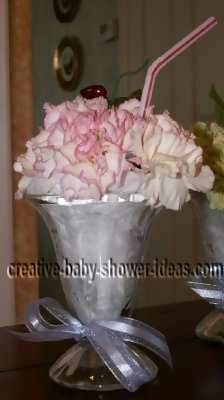 A flower ice cream sundae can add a classy and fun touch to your baby shower or girl get together. This life like craft can be used with many themes including "a pickles and ice cream theme" and "a summertime theme". Cut your floral foam to fit inside your ice cream dish, leaving a little space on the outside to fit your tissue paper. Wet the foam and place in a plastic bag, leaving the top exposed. This will allow your tissue paper to remain dry. Add a layer of tissue paper inside your ice cream dish and fit the foam in place inside the tissue paper. If done correctly, you will not be able to see the foam. Cut the stems off of the carnations and arrange them in your dish. 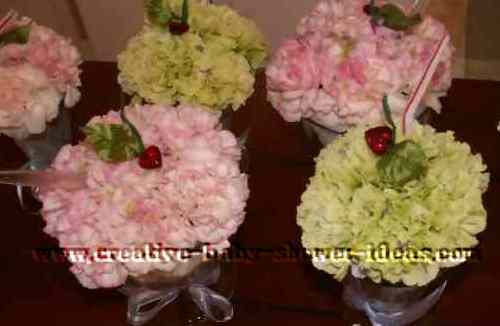 You will want to start on the outside edge and form a circle with your carnations. The remaining carnations will fill the center of the circle. Push the base of the carnation into the foam to hold it in place. The number of carnations you use will depend on the size of your dish. 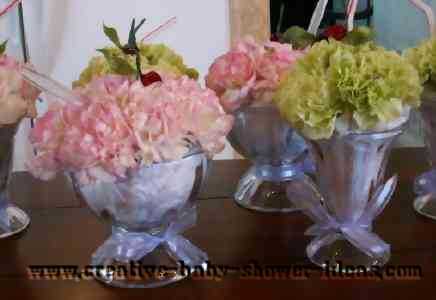 In the smaller sundae dish, I used 4 carnations in the outside circle and one for the middle. For the larger sundae dish, I used six for the outside circle and 2 for the center. Cut a piece of wire about 3 inches long. Position the silk leaf and heart charm on the wire and wrap everything in place with the floral tape. Push the bottom of the wire into the foam in-between the flowers. Top off the look with either a straw or clear spoon in the foam. To create the "sprinkles" on your floral ice cream, sip your contrasting flowers with scissors and sprinkle along the top of the sundaes. Tie the ribbon in a bow around the sundae dish and you're done! Great idea Kris! Thanks for sharing it with us! Got a great centerpiece idea? We can't wait to hear it! Share it with us and it will be featured on its own craft page!